QUESTION: Hi Martin, I am a long time reader and so appreciate your daily blogs, You have taught me so much about the global interconnectivity of markets and human nature of the “herd”.Thank you for your life dedication to the pursuit of Truth and justice. You are appreciated more than you know. My question is that many other economists disagree with you, in particularly —– —-, who believes fervently that Gold is something that will wipe all of us small people out in the coming crash. Can you please explain to us small people who have nothing to hang onto but your words of wisdom and your life long experience of what we need to do as this all reveals itself, with the EU et al, and Debt servicing unwinding worldwide. Thank you, so much Martin for all your knowledge and your life’s dedication to life, liberty, and justice. I hope to attend your next seminar for the first time ever. I am saving to attend as I like others cannot afford to be caught on the wrong side of what is unfolding and must learn from the ONLY person in the world I trust that is telling us the truth about what is unfolding and how we small people must protect ourselves. ANSWER: I really do not see where such analysis comes from. If the stock market crash, gold crashes, and everything turns to dust, what goes up? Dollars? The problem lies in the fact that they are all following Karl Marx. Not that they are communists or even socialists. Marx changed economics. He fought against Laissez–faire and won. It is like putting someone on the witness stand. You then ask the question: “So when was the last time did you beat your wife?” That now sets the agenda. You will respond swearing you never beat your wife and your wife will say no he never did. The cunning lawyer will tell the jury she is not to be believed because she would lie fearing she will only be beaten again. This is what Marx did. He said government has the right and the power to control the economy to eliminate the Business Cycle. Every economic theory ever since including Keynesian Economics, has all continued down that path. Government is the 800 pound gorilla in the room. It can be omnipotent and rule the world. 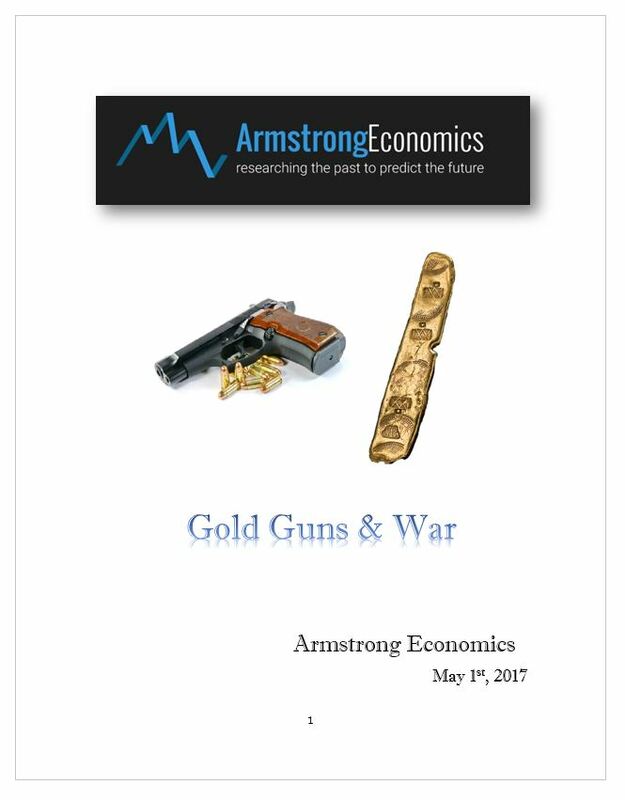 I have produced a major report, which traces how gold responded through all sorts of events. Sometimes it has rallied, and other times it has failed. The underlying facts are important. During the Civil War, year gold rallied sharply into 1864. 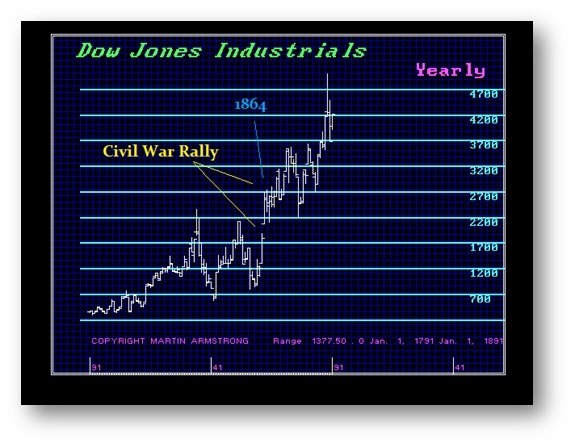 However, when the war was over, gold fell, but the stock market then took off big time. 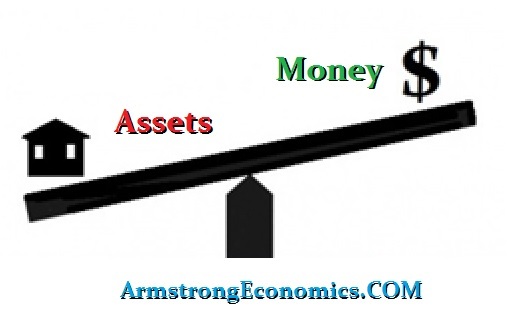 I can find no instance in history where the combination of events of the stock market and gold crashing within everything turning to dust ever existed for a brief time, but that is when cash rises in value and you get deflation – money up assets down. But given the Sovereign Debt Crisis we face, I really see nothing like that on the horizon. This will be put online next week. It was included in the Hong Kong Conference.